Writer: Chuck Austen: Art: Ivan Reis, with Joe Prado, Jon Sibal. Inks: Marc Campos. Colours: Guy Major. Letters: Comicraft. Editor: Eddie Berganza. Friends accuse me of being overly critical on occasion, of expecting more from the average comic than can reasonably be asked. Surely not, I hear you gasp. YOU? -- the voice of the common man? Alas, it's true. I can be nitpicky. 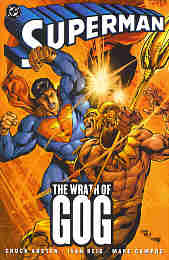 So when, on impulse, I picked up Superman: The Wrath of Gog, I was determined not to fall into that trap. I was ready to be entertained with a breezy adventure involving everyone's favourite illegal immigrant and demand nothing more. The TPB collects Action Comics #814-819, but begins with a couple of scenes lifted from Action Comics #812 and 813. These opening scenes are decent enough, one establishing Lana Lang and her current place in the Superman mythos, another a grim sequence involving a little boy left feeling betrayed by a hollow promise made by Superman. Things truly begin with Superman as Clark Kent returning to work at the Daily Planet, but given the run around by the staff (he's been demoted, but no one wants to tell him). Interspersed with this are a couple of familiar Superman type scenes, one involving a robbery, the other rescuing a car going off a bridge after the driver is distracted by the obligatory kids in the back seat. Familiar scenes that normally warrant a few panels...but writer Chuck Austen and artist Ivan Reis devote six and three PAGES to them respectively. And it's not even like they do anything clever with them (you know, maybe Superman stops the robbers secretly while still Clark, with a bit of judicious heat vision, some super breath, maybe super speed slight of hand). After a big fight with some of Darkseid's minions, Supes learns Doomsday is loose (oh...him again -- but he never appears). Then he gets summoned to Smallville by some Teen Titans when Gog shows up -- big fight ensues (two issues worth in fact). Then an injured Superman is beset by a legion of baddies hoping to kill him while he's recovering -- cue next two issue smackdown, with Wonder Woman and a few others along for the ride. I have nothing against action, per se. But the action itself should tell a story, there should be some novelty to it, some strategy. Something off beat as Superman uses his brain, not just his brawn. I sometimes jokingly use the phrase "Superman science" as a reference to all those old Superman comics where Supes would employ a scientific fact that was right in principle, even if ludicrously applied in the context (similar to a "MacGyverism"). "Superman science" seems a thing of the past. The modern Superman's idea of strategy is to hit the bad guy, and when the bad guy, inevitably, hits back, then Supes hits him again, and again, and again. End of strategy. In fact Superman here seems to revel in the brutality in a way that is, frankly, a tad unseemly for a hero. The book is filled with page consuming fight scenes, splash pages and two-page spreads. With its passing reference to Doomsday, and non-stop fights that are meant to push Superman to his limits, and beyond, one suspects that Austen considers the long ago The Death of Superman story the pinnacle of comics excellence. Oy vey! There's little plot to speak of -- none of the villains have any motive or goal other than to kill Superman, we aren't asking questions, or trying to puzzle a cryptic clue, one scene doesn't really lead to the next, or anything. That early scene with the little boy seems entirely irrelevant. Gog, after whom the collection is named, only appears for his sequence, then is gone, with even Superman seeming in the dark as to who and what he is (though I was sure they'd fought before). Perhaps most telling about the modern Superman's intellectual inclinations is that it falls to a secondary character (Superboy, who isn't a young Superman these days) to wonder who Gog is and what his motive is. And since Austen eschews the use of thought balloons, the fights tend to be pretty anonymous affairs, rather than filtered through the various characters' perspectives. And there's little else that's going on. Other than the minor Daily Planet element, there are no sub-plots -- Austen introduces reporter Jack Ryder, presumably as a kind of more obnoxious Steve Lombard substitute (for you fans of Superman stories of decades ago) but that's not a "plot", since it doesn't go anywhere within these pages. Austen's approach to Superman's character is to loosen him up by having him crack smart alecky remarks and quips as though he just attended a seminar hosted by Spider-Man on "How to be Witty While Delivering a Haymaker". A writer should be allowed room to put his own spin on even an established character, but, to me, it just seems so not Superman it's distracting (or maybe it's just that I didn't find it that funny...nor a later, veerrrry long scene, with what's meant to be a comic relief obnoxious scientist). Austen's approach to writing Superman is to make him sound about 14 years old (which I've long suspected is an editorial edict DC has issued for most of its supposed adult heroes). This approach clashes when it turns out Clark is being demoted because editor Perry White wants to market to a younger demographic -- any younger, and Perry's going to have to start raiding kindergartens for his star reporters! Still, all the mindless fighting does serve a sort of purpose, as it builds to a sequence where a convalescing Superman must contemplate the relationships in his life, as Lana Lang shows up to minister to him, but his wife, Lois, is nowhere around. It's an unexpected character turn, and one wonders if Austen, or DC, are going anywhere with it. At least it's a more talky, character-driven sequence (although broken up with yet more fights with motiveless villains). But I still have qualms with scenes where characters sit and boldly lay out their feelings and emotions. Character should drive the action, and action drive the characters. Separating the two -- here's a ten page fight scene...here's a five page character scene -- still strikes me as weakish writing. The biggest appeal to the book is the striking art by Ivan Reis, inked by Marc Campos. It's lush and attractive in a Stuart Immonen-esque way. It holds the eye. Though Reis' storytelling eye is occasionally weak. For a story where so much of it's action, there were some action sequences where it took a moment to quite figure out what was going on. When the Darkseid's Apokolipian agents arrive via a teleportation "Boom Tube" -- well, I suspect you'd need to know the mythos, or you wouldn't understand what that "boom"ing sound was, or how the characters appeared. I really tried to be open minded and uncritical. But though there's some nice art, and a sort of interesting character thread toward the end, this collection of stories are largely plotless, unimaginative fight scenes. Action? I suppose. Adventure? Not so much. Entertainment? Hah -- don't force me to get critical. You wouldn't like me when I'm critical.